A smart thermostat is a smart investment. It immediately adds value to your home. Consumer Reports estimates that millennials will pay 3 to 5 percent more for a home with smart amenities. Plus, a smart thermostat can pay for itself in energy savings. Each thermostat works via WiFi to let you control your thermostat with your phone from work, your beach vacation, or really anywhere. But their individual features can vary widely, which is why I want to compare some of the best-selling smart thermostats to find an overall winner. 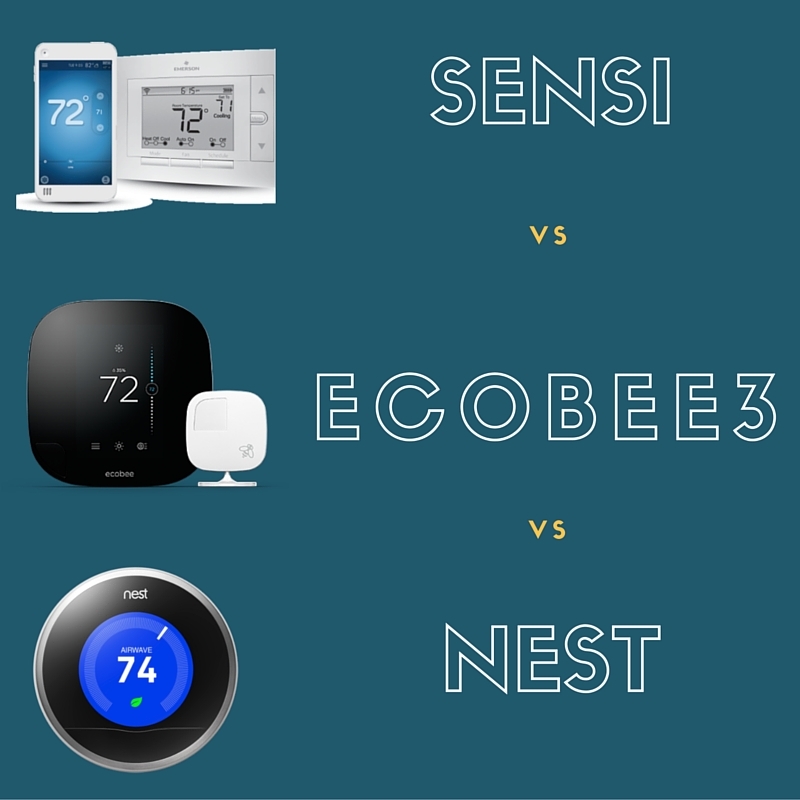 Let’s break down the pros and cons of Sensi vs. Ecobee3 vs. Nest. In addition to simple DIY installation, each brand also offers professional installation for ~$65 depending on your location. Labels for keeping wires organized are also included with each thermostat. Reading through the Amazon reviews for these three products can be intimidating. Each home is unique and some customers have a difficult time installing these thermostats. However, many customers say that Sensi was easier to install than Nest. Since it doesn’t require a C wire, don’t worry about calling an HVAC specialist to add specific wiring and it claims to work with the most systems of any Wi-Fi thermostat. Even if your home doesn’t have a C wire, you can still get Nest or Ecobee3, you just need to do a little re-wiring using a Power Extender Kit, but this does make it more difficult to set up. Ecobee just deserves to win this category. The thermostat is an absolute data-lover’s dream, allowing you to truly cut back your energy savings. Compare your energy usage regionally through HomeIQ reports. Data includes percent saved, system runtime, average monthly temperature, and plenty of other information. Its weather functions also make perfect sense. If it’s cold tomorrow, then there’s no reason to blast the AC. Ecobee3 is smart enough to figure this out and let you just enjoy your comfortable home environment. As always, the easiest way for a hacker to get inside is with a weak password. Make sure your password is unique, long, and not predictable. Depends on Sensi web servers. When you change the temperature in the app, the information is sent to the Sensi servers, which tells the thermostat to adjust. While this is more secure, it means that if Sensi’s servers go down, so do your smart features. All of these thermostats have good security, but none stand out as a clear leader. All three depend on manufacturer servers to pull data, which can be a negative if servers are down or the company goes out of business. It seems that this is the way industry trends are leading, for better or for worse. All three thermostats are directly compatible with Alexa. Works with Nest Protect CO monitor. If CO is detected, it will notify Nest thermostat to turn off the furnace. Motion detection by Nest (AutoAway, which detects Farsight and near sight motion) doesn’t work as well without sensors. For example, if Nest is in your hallway and doesn’t detect motion, it might assume you are away and turn off your air, when really you are just in the kitchen. The checkmarks show the winner of this category! While Nest and Sensi don’t have anything seriously wrong with their smart features, Ecobee3 does a lot of things right. 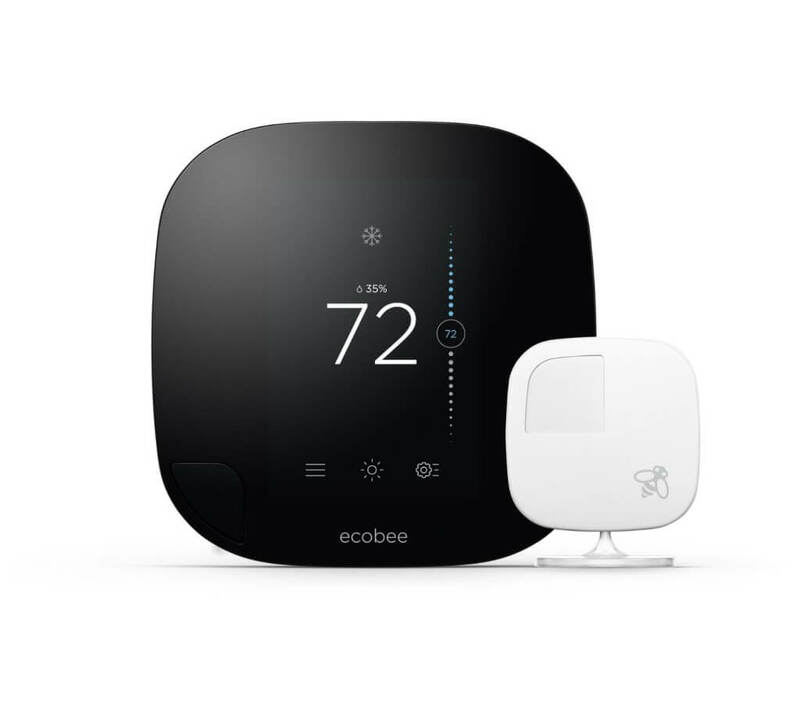 Its long list of compatibility and ability to learn your schedule in a way that makes sense (via sensors placed throughout your home) is why I consider Ecobee3 the smartest smart thermostat available. You can’t argue with Nest’s relaxing blue display when it’s cooling or brilliant orange when the heat is running. Nest’s display looks like how we imagined our smart homes would look. Simply turn the dial to change the temperature and watch the display estimate how long until it reaches your target temperature. The little green leaf indicating energy savings is a fun touch. Set a heating and cooling temperature. This allows you to heat in the evenings and cool in the afternoons without having to constantly adjust the target temperature. Works on a battery. This automatically recharges as it is plugged into your HVAC system, but during the recharge the thermostat is shut off with a red blinking light indicating that the thermostat is charging. This was a very tough call between Nest and Ecobee3. While Ecobee has its flaws with interior sensors, Nest’s warranty with lower coverage and 3 degree temperature swing are the game changers here. Ecobee3’s parts and labor warranty can give you peace of mind that you won’t be fixing it yourself if something goes wrong. Ecobee3 is simply an excellent thermostat. Use it for a month and you’ll become obsessed with its beautiful and intricate reporting system. Hook it up with HomeKit (as long as you have Apple TV 3rd gen) to control your thermostat via Siri. Then you can connect with HomeKit compatible lights like Philips Hue to set up an away mode that effortlessly saves you energy when you walk out the door. 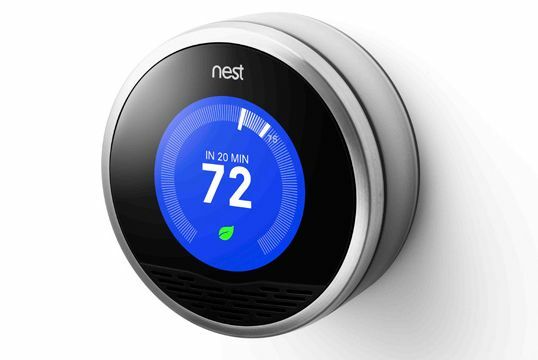 Of course, Sensi and Nest are incredible products. Sensi is way cheaper than the alternative products, typically landing around the $105 range on Amazon, while the other thermostats are in the $250 range. Some people want easy smart home products that they can simply control with their smart phone, and Sensi delivers this. If you aren’t concerned with fancy designs and reports or are on a budget, install a Sensi for sure! You can’t argue with its nearly 5-star ratings and Best Seller rank on Amazon. Additionally, if you’re looking for one device that easily works with WiFi cameras and a CO monitor, then Nest may be the way to go. Plus, it certainly wins for beautiful design! 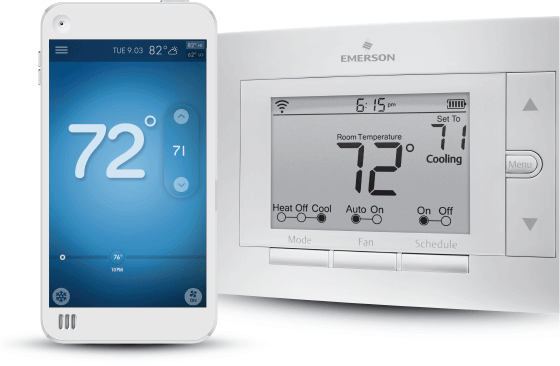 For more smart thermostat information, head to our Smart Thermostat Comparison to compare these products with Lyric, Honeywell, and others. If you need help selecting the smart thermostat that best matches your needs, use our Solver tool, where you can prioritize the features you want and get matched with a smart thermostat compatible with your home in less than 30 seconds. The reviews are confusing on the C wire. Amazon review linked to Smart Thermostat Comparison in this article says “doesn’t need a C wire”. The Cnet review says you need a C wire or install the power extender, basically “you need a C wire” which in above says “works with a C wire”. “Works with a C wire” doesn’t translate into “needs a C wire or work around to work”, it sounds like an optional thing. Please clarify – simple answer – Needs a C wire or not. I updated the review with your feedback. Thank you again. The deceptive thing about the C-wire requirement is that, really, pretty much all smart thermostats other than the Sensi either require the C-wire. The only difference is that you can get around the requirement by repurposing existing wires using one of these “power extender” kits. It’s nice that Ecobee includes the kit but you can buy them for any smart thermostat for less than $15. The only question is whether you want to go through installing them. In that respect, the Sensi really is the only smart thermostat that truly doesn’t require a C-wire. Hi Ken, That absolutely makes sense. I can see how listing Ecobee3 as not requiring a C-wire is inaccurate–the power extender is just a workaround solution for those without a C-wire. I edited the article with the information your provided me. Thank you for helping us be more accurate! The difference between Nest and Ecobee when there is no C wire – Ecobee support looked at my wiring diagram and told me I needed to run a C wire to the thermostat. The Nest was able to find power among the existing wires and works as is. Far simpler! This is very similar, though much more straightforward than other reviews and I appreciate the format. One area that is missing is security and network traffic. I am leaning to the Sensi as it has very minimal network traffic and is pretty darn secure, at least that is what several reviews on Amazon said. I haven’t seen confirmation, but have to assume that since Ecobee data is kept on hosted servers that it has a lot of network traffic and is more susceptible to hacking as is Nest. I’m also concerned that if Ecobee were to close shop I may end up with not only a dumb thermostat, but a non-working one. I want to know that in the world of acquisitions and companies making changes in directions that my smart thermostat remains functional in the future regardless of something happening outside of my firewall. Thanks for your comment and we appreciate the great feedback. I agree about security, traffic, and longevity – those are big areas and areas we can certainly add to this article. Let me research during this week and update the article with information (including some of the examples you listed above). I will get back to you soon. We updated the article with a section about security and servers. Hopefully it will answer some of the questions you have. If you have any further input about the security or network connection of these devices, let me know and I can add it. Thanks again for your feedback!